Growing your Instagram followers is great way to grow your business because you get to expose it to more people. But lots of people struggle to get new followers. 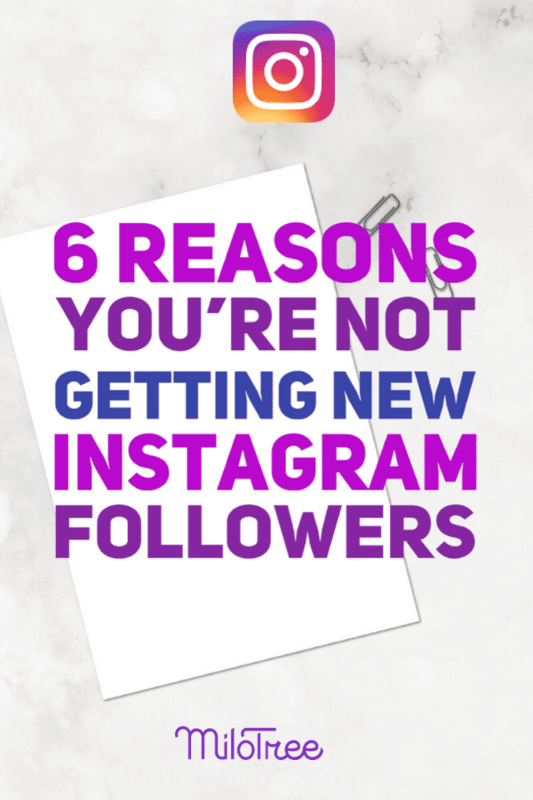 Check out these 6 reasons you’re not getting new Instagram followers, and see if you’re making any of these mistakes. Instagram is a platform that rewards niches. People follow you because they know exactly what they’re going to get from you. If you’re too broad, you confuse your audience and people are less apt to follow you, or might even unfollow you. Pick a narrow lane and stay in it. This means if you’re a “lifestyle” blogger, see what subcategory resonates strongest with your audience — be it food, travel, fashion, etc. — and then stick to that one thing. On Instagram you don’t want to try to be everything to everyone because you will end up being nothing to no one. Instagram and your followers reward consistency. Find your most engaged times by looking at your app analytics, then post at least 2x per day to your feed during those times. Experiment with photos and videos to see which your audience responds to best. Let yourself have more fun in your stories. Show your personality and even your mistakes. Show the behind-the-scenes of your business. Experiment with both photos and videos (videos can be up to 15 seconds each). Use hashtags and geotags in your Stories. This will help your content show up in the Explore tab. Make sure your stories are relevant to your business and not just stuff your mom would want to see. Remember, your stories disappear in 24 hours, so experiment a lot! One of the greatest things about Instagram is the ability to engage. If your account has lots of engagement, you signal to Instagram to show your posts and stories to more people. The more people who see it, the more followers you get. Simple. So make sure to engage with everyone who comments on your posts or send you a DM (Direct Message). Any time someone reaches out, through a comment or DM, it opens the door for you to have a conversation with that person, and build a relationship. If you sell a product or service, this can be a great way to gain a new lead or fan. Some of the most successful people on Instagram set a time every day to engage on the platform. Make sure to be timely in your responses because it shows your audience that you care. Another way to engage is to write interesting or thoughtful comments on other people’s posts. This can be a successful strategy to get noticed by people in your space, influencers, and brands. Find content to engage with by searching relevant hashtags for your business and engage with those posts and those influencers. If you are location-based, definitely search geotags and engage with people who are physically near you. Build engagement with your audience by asking them questions, either in your feed or in your stories. You can use the “ask-a-question” sticker or use a poll in your stories for an easy way to engage. You can also ask people to “double tap” on a post in your feed if they like it or they agree. An additional strategy is to ask people to tag a friend who might like your content. This is a great way to get your followers to introduce you to their friends who are likely to follow you too. Instagram is a platform that inspires, educates, and entertains. Make sure your posts are focused on providing value to your audience first, and not just about you or what you sell. People can smell when someone isn’t being authentic. Instagram is a platform that rewards authentic content and engagement. For every post that is about selling, make sure you post 5 additional posts that inspire, educate, or entertain. Focus your bio less on you, and more on your target audience. You want to communicate how your Instagram profile will help or inspire them. Also, create a hashtag for your business, put it in your bio, and encourage other people to use it. Use emojis in your bio, but with good taste. Use your one bio link strategically. Link it to your website or blog, to a specific post, or use a service where you can highlight different pieces of your content at once. Also, don’t be afraid to change up your bio from time to time to keep it fresh. Instagram posts with at least one hashtag get more engagement than posts without hashtags. Instagram allows users to add up to 30 hashtags per post. Studies show that the more hashtags you use, the better your posts perform. Since the goal with hashtags is to attract people to your posts, take both a broad and niche approach to adding hashtags. One way to find relevant hashtags is to look at the ones your competitors are using, and try those. Also create a hashtag for your brand and use it in all of your posts, in your bio description, and ask people to use it when talking about your brand. To avoid looking spammy, use different hashtags in every posts. Switch it up so you look like you’ve put time and effort into your hashtags. And if you have a physical business, definitely use geotags and geo hashtags in your posts and stories. This way your content is more likely to show up in the Explore tab of other people based on their interests and location. If I’ve missed any other big mistakes people are making on Instagram, please reach out and let me know. And if you’re trying a new strategy that is working, I’d love to know that too! And if you want to get more Instagram followers, try the MiloTree Instagram pop-up. It will get you more highly engaged Instagram followers effortlessly. It takes your blog traffic and turns those visitors directly into followers. Also, if you want to see the 5 apps I use to manage my 150k+ follower Instagram account, take a look at this post.